We offer photo sessions in the studio, by the bay, at the beach, or many other scenic locations in Panama City, Panama City Beach, and Walton and Gulf Counties. I am available for further travel, but additional fees will apply. Session fees are payable in advance by check or credit card at the time of booking. The balance of the minimum investment will be due the day of the photo session. We will schedule an ordering appointment within two weeks of the photo session. Please have everyone present at the ordering appointment that will take part in the order decisions. For those out of town, orders may be placed online. I would be happy to schedule a "virtual" ordering session with you. Please call or email for details. Please cancel your session 24 hours in advance...BUT...if your child becomes ill or is having a bad day, please call to reschedule. The way your child feels will be reflected in his or her portraits. Please try not to beg, plead, or otherwise entice your child to "be good" or "smile big." Letting things come naturally makes for much better Images. So plan on having fun! Prices include basic retouching. Extensive retouching and enhancements are $35 per hour. A clothing consultation prior to your session is recommended. Layering works great, offering quick change and options in your images. Hats and other accessories can add fun and interest as well. Neutral colors like khaki, white, and denim are nice for shorts, skirts, or pants. It's not necessary that all shirts be the same color or style but should be cohesive and preferably solid for large groups and more formal family portraits. FYI...its no longer breaking the rules to include beautiful, vibrant colors and patterns as long as they still present a cohesive look and you're not looking for a formal portrait. 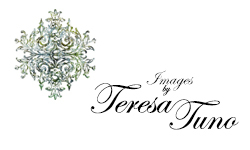 Copyright is the property of Images by Teresa Tuno. It is unlawful to reproduce images in any manner unless you have been given written permission. Images by Teresa Tuno may may use images for promotional and advertising purposes in print and on the internet. No names will be used. I am happy to set up a consultation appointment with you to help you select clothing for your portrait session, to help design your wall portrait displays in your home, and to assist in gift ideas for the special people in your life.